The 110v R4 produces enough water on demand to run 3 operators at 50’ in the window cleaning industry. The system is powered by a large 1 horse power motor. 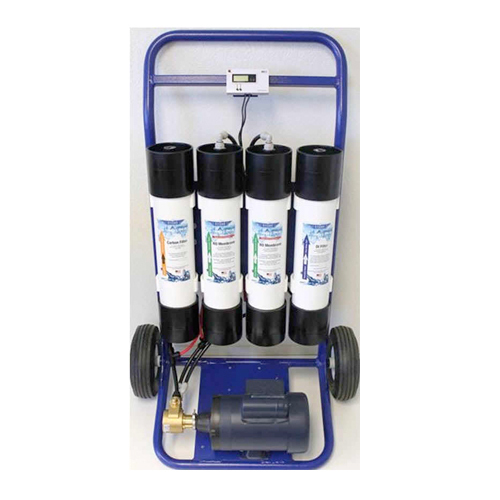 Standard features include a professionally powder coated aluminum frame, manual on/off control switch, a 4 × 21” carbon filter, two 4×21” reverse osmosis membranes, a 4×21” de-ionization filter, a large 1 horse power motor, a brass rotary vein pump, a pressure regulator, a factory set concentrate valve, an in-line water quality meter and a 0-300 PSI pressure gauge.